If you have been already preparing to become an ultrasound technician by attending college or technical schools, then most likely one of your main concerns is how you move from going to classes to finding employment. We hope to provide you a few helpful tips here in this brief article and thus help you find ultrasound tech job opportunities. One of the first places we recommend you to start your ultrasound technician career search is from your college or school . 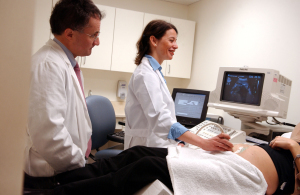 Most ultrasound technician schools have very good career placement offices in house where you can talk to a counselor or adviser about your goals and career ideas. Some students want to focus on small family medical practices to find a position as an ultrasound technician. Others want to work in a larger hospital environment. Yet others still would rather not work with human patients at all and instead work in vet clinics or on farms. Its really up to you as far as the many paths that you can take. Often times, in our own experience many medical practices and health care facilities have established relationships with the best ultrasound technician schools. What we mean by this is that they often work directly with the school to find the best qualified students who graduate. If you focus on your schoolwork and also are willing to do a little bit of personal networking with your school’s teachers and professors, you’ll undoubtedly have a surprising number of options upon graduation. If you have ever heard the phrase that its “not what you know, but who you know”, this bit of advice could go a long way to helping you land a great job and possibly a great career. Our personal belief is that many of the best available ultrasound technician jobs are not advertised (at least at first), but instead they are often floated to the schools and others in the medical community first. Finding a good job from word of mouth through keeping personal relationships with as many of the teachers and school officials as you can is a wise course of action.